Usually, all the children under 18 live with the same parent and visit with the other parent together. Sometimes, though, the some children may live with one parent most of the time and other children in the same family may spend most of their time with the other parent. This can be because one parent is better at nurturing small children while the other is better at dealing with teen-agers. Or perhaps one parent keeps a child with significant disabilities and, in order to help that parent focus on the needs of the child with disabilities, the other children live with the other parent. Whatever the reason for splitting custody, there is always the issue of child support. Who pays how much to whom? The Texas Family Code does not provide an explicit answer to that question, but attorneys and judges tend to approach the question the same way. Let's say we have a divorced mother and father who have 3 children together. Let's assume both parents have remarried and, to make it interesting, let's assume the father has had 3 more children with his new wife, but mother has not had any more children. Finally, let's say the parent's have a 15 year old daughter who just can't live with her mother any longer and the parents agree that the 15 year old daughter will live with her father and the other two siblings will live with their mother. How Much Child Support is Due? First, compute how much child support the father should pay the mother for the two children that are living with her. You do that by determining his monthly net resources and applying a child support factor to it. What is his child support factor? According to the Texas Family Code, because he has one of their children living with him AND he also has three other children from his second marriage living with him, his child support factor would be 19% (Tex. Family Code § 154.129). Assuming his monthly net resources are $3,000, he would owe mother $570.00 in regular child support each month. Second, compute how much child support the mother should pay the father for the one child that is living with him. Her child support factor would be 20% because one of her children is living with the father and she does not have any other children. Assuming her monthly net resources were $3,000, she would owe father $600.00 in regular child support each month. You can set up the order so that father is ordered to pay mother $570.00 each month and mother is ordered to pay father $600.00 per month. There are a number of reasons that attorneys might want to do that, but I think it just sets the parents up for failure. My suggestion is that you take the higher child support figure ($600.00 from the mother) and subtract the lower figure ($570.00 from the father) and have the mother pay the father $30.00 per month in child support. There is a reason for having mother pay child support of $30.00 per month rather than just forget about it because it is such a small amount. If she pays this child support each month, if you write the order up properly, it will be clear that the child support ordered is substantially in conformance with the guidelines. When child support is substantially in conformance with the guidelines contained in the Texas Family Code, the rules for changing child support are easier to understand and invoke. I have given a simple example here. My simple example does not include provisions for health insurance for the children nor does it look to see whether child support should be above or below guidelines. If the father in our example is keeping the one daughter because she has severe medical problems or substantial intellectual or physical disabilities, father might successfully argue that mother should pay more than guideline child support in order to help defray the extraordinary costs of caring for the child. Likewise, mother can seek reimbursement from the father if she is paying for the children's health insurance. For a list of factors the court might consider in determining whether child support should be above or below guidelines, look at section 154.123 of the Texas Family Code. What about ordering that neither parent pay child support to the other? Section 154.124 of the Texas Family Code allows parents to make agreements regarding child support and, in many courts, those agreements are routinely adopted by the court without many questions. 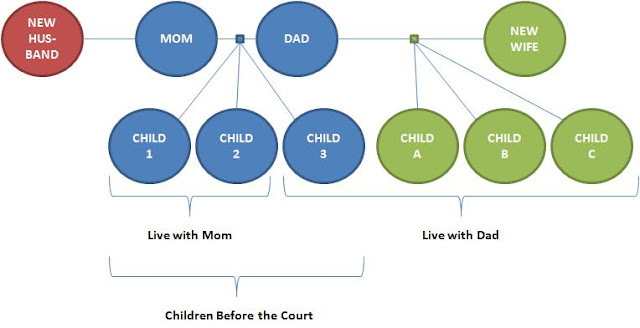 In the example we worked through above, we might draft language in the child support section of the order that says, "The parties represent and the Court FINDS that the parties each have approximately the same monthly net resources and that the application of the child support guidelines results in each party paying the other party approximately the same amount of child support each month. Therefore IT IS ORDERED that neither party shall pay child support to the other party at this time." If you are an attorney drafting this order, I would carefully counsel my client to understand that even with the above language, fortified with a caveat such as "Both parties agree to never seek child support from the other party ever, ever, never, ever," the court has the authority to order one parent or the other to pay child support in the future if there is a material and substantial change in circumstances, particularly one that was not reasonably foreseeable at the time the "no child support" order was signed. That's why I prefer to go ahead and have one party pay the other, even if it's a small amount, just so that it's clear that the court has the authority to order child support. What if your client insists on the "no child support" order? I would urge you to draft a sentence at the end of the "no child support" language that says, "The parties understand that even though they have agreed that neither shall pay child support to the other at this time, the Court retains the authority under Texas and Federal law to order child support in the future if doing so would be in the child's best interests." There are a number of reasons that siblings might not live in the same household. Determining how to handle child support in such split-custody arrangements is not explicitly ordained by the Texas Family Code, but the Texas Family Code does contain enough guidance to assist the parents in coming up with a good order.